The Republic of Ireland’s request for an extra berth in next year’s World Cup finals is perfectly understandable given FIFA's harsh ruling on their demand for a play-off replay with France, but I can’t say I’m in favor of it succeeding. Thierry Henry and the offending handball. Yes, I know that FIFA president Sepp Blatter and his cohorts have said they will give it due consideration, along with Costa Rica’s bid for inclusion in the wake of a dubious goal by Uruguay in their play-off, but I think to expand the finals from 32 teams to 34 would be bad for the tournament. When I first started watching the World Cup it had only 16 teams; the Finals lasted barely three weeks; and being part of that elite group carried massive prestige because the number of finalists was so small. The limited entry also allowed us, as fans, to get to know the players, and personalities, and the character of each team, so that Pak Doo Ik of North Korea carried as big a wow factor as a more familiar name like Bobby Charlton or Pele. For three weeks we were cocooned in a football dome full of high intensity and a special kind of magic that came from the real or imagined spectacle of seeing the best tackle the best. Contrast that with 2010, when 32 nations will take part in an amorphous tournament lasting just over a month, featuring several teams that would not have made it had they been located in a stronger geographic qualifying region, and involving so many players and personalities that it will be a full-time job keeping track of who’s who and what this match means to that. Not that I’m deriding the tournament. It’s still the greatest show on Earth for football fans like myself, but it has become a victim of its own success. It’s now too big in my opinion, with the result that some of the passion, intensity, and cache of being involved as a player, coach, and fan has been diluted. And now they’re apparently considering extending the tournament to 34 teams? Lunacy! That would be a logistical nightmare for the organizers; unfair to the 31 teams (aside from France) who got there legitimately; and supremely unjust to the unfortunate nations drawn in the two groups of five from which only two would advance to the second phase. And not only that, like the summer Olympics and the European Champions League the aura of the competition would be further diminished for the fans, because, for me, you can have too much of a good thing. So, sorry Republic of Ireland, I was fully behind your quest for a replay of the game with France, but I can’t back this one, for the simple reason that sometimes less is more. Was the dig at France necessary? They qualified just like any other team in the finals. I'm sure they're not the only team there with the aid of incorrect refereeing. Ironically, Ireland were in the play-offs courtesy of that. Let's stop this manhunt, Thierry Henry committed a foul, no more than that. No different from the dives, body grabbing, play-acting we see in every single game of football, the referees spot it more of the time but they're only human. Ireland are actually doing worse for sport by showing what bad losers are like. 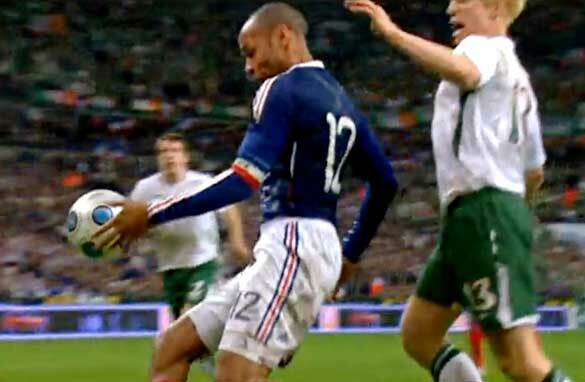 I think the recent request by Ireland to be team number 33 in the world cup only reflects how desperate the Irish want some justice to be done after being denied the world cup by Henry's blatant Handball. I am surprised by FIFA's indifference and I am certain that if FIFA continues to let situations like this go unpunished,then the beautiful game might loose its prestige and glamour. FIFA has lost all International credibility with regards to fair play. Their arrogance and indifference towards the non “Football Powers”, such as the Irish, and their one-sided support of the French Team is something they will not soon recover from. Adding to this, their self-centered and egotistical resistance to technologies that could readily circumvent the ever increasing failures and “blind eyes” of the FIFA Referees is untenable. Terry, your elitist attitude towards limiting the number teams able to qualify for the World Cup is the same arrogant attitude that is so prevalent in the mind set of FIFA. To think we should be limited because of your inability “to get to know the players and personalities” is your problem, please don’t handicap us with your limitations. Disagree on limiting the number of teams and less being more. The playing field has long been a place where we could at least attempt to set aside less desirable forms of national competition. The World Cup may well be the very best opportunity–everyone can play this game regardless of race, religion, or economic circumstance, and every country has a shot. For some, just getting to SA and getting out of the first round will be inspiring. The more of the world represented the better and more beautiful the game. Thierry Henry is a blatant cheating disgrace for football and should be banned. There's cheating, unfair play and there's blatant cheating, unfair play and bad sportsmanship. He is all of the above. Yes the ref didn't see the handball, and yes the linesmen didn't see the hand ball or the 2 men off-side for that matter, but Thierry Henry committed the worst crime in football with the world watching. He was smug in his celebration of the goal and then regretted it and apologized to all the Irish players. What kind of example are we setting for all the young kids that play the sport everyday? For a man like Henry who goes to Schools to teach fair play and to be honest....NO. You can blatantly cheat and get away with it. I hope France win the World Cup to be honest and see how the soccer world feels then. Everyone likes the Irish... until they get to know them better. They're irrational and sore losers pure and simple. Bad sports. Witnessing their behaviour over the 2009 Rugby season and them STILL moaning about BoD getting injured in the 2005 Lions tour tells me much about them and their values, let alone this idea that it was deliberate or even premeditated. Sorry Bob but you obviously don't know much about soccer. Everyone on the pitch does whatever they can get away with, I mean, EVERYBODY. From body checks, to pulling shirts, to claiming the throw in is yours, to grabbing the other player's torso to prevent him from scoring and yes even sometimes, the foul is deliberate and you take the punishment for the team. Don't worry about the kids, they'll be fine, you raise your child in your house to do the right thing, it's not Thierry's job to raise your son. Come to think of it, football is just like real life and the most important thing I would like the Irish FA to teach my kid is how to not be a sore loser, that's even worse. Move on, it happens.....all the time, it's called life. If every foul not given by the referee is reviewed and the team penalised, then the game will become a joke. The irish could at best have gotten to penalties which they are not guaranteed to win. I think even trying to get to be the 33rd team is cheating in itself. But he did what any professional football player would do. The question we should be asking should not be whether the match should be replayed or not. It should be about what needs to be done to make sure this kind of thing does not happen. There are those who say video refs would slow down the game. Fine, don't let it change the outcome of the game. But in any other sport, when someone is caught cheating they are punished/fined/banned. Football is the only sport that I know which encourages, (even rewards), cheating. Make a rule – next time someone cheats ban him/her for some time (just like if he took performance enhancing drugs), the game might then become about good sportsmanship. Until then...the best players are the ones who know how to cheat. Whats; the point of discussion when FIFA has said no more than 32 teams. FIFA is a laughing stock and no pun intended. The people who administrate are a bunch of cheats, thugs and what not. Regional representation – my foot. If the WC selections are based on regional representation then why bring Australia from Oceana to Asia? Why does Israel and Turkey play in Euro qualifications? OK coming to France – Ireland – there should have been guidelines put in place by FIFA on such video evidences matches need to be replayed. None exists. Calling Henry a cheat – is blatant. It is not his job to determine hand ball or not. It is to the refs to make the call. Remember – Maradona's goal? Even video evidence was not conclusive. Yet he was the hero for many. So why should Henry be labeled a cheat? Go ask the question to FIFA. If FIFA was proactive rather than reactive – such guidelines would have been put in place. These thugs want money and they are after gobbling those Rands, dollars, pounds or whatever they can get their dirty hands on. Period case closed. With so much at stake – making it as a business model – it is not part of a player to umpire the decisions. There is no sport that has not been cheated and soccer is not immune to cheats, fixing, influencing, dirty tackling and much more. Let's all shut up and Let the games begin.